About Am I Really a Christian? 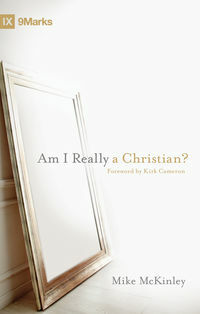 Each chapter title begins with “You’re not a Christian [if/when/just because you]…” As he surveys what it means to be Christian, McKinley offers criteria for evaluating one’s standing before God. Readers are guided through a series of challenges to reflect, repent, remember, and report to another person. Am I Really a Christian? ends with chapters on salvation and the local church. This unique book is written for nominal or new Christians and can be used in personal or small-group study. God knows his own. Just saying we’re a Christian doesn’t make it so. God sees “us clearly, we don’t see ourselves clearly.” I loved to Willy Wonka and how God makes it clear what we have to do to be a Christian. There are no “hidden clauses.” He uses many analogies. “Our life is destroyed by sin, not damaged by it. He used a rotted closet to represent our sinful lives. We can’t patch it up. Christ must replace every bit of the rot with his love and grace,( see page 35). Just “liking” Jesus doesn’t make us a Christian. MIKE MCKINLEY received his MDiv from Westminster Theological Seminary and is the author of several articles and reviews. He served on the pastoral staff of Capitol Hill Baptist Church in Washington DC, and in 2005 was called to revitalize Guilford Baptist Church in Sterling, Virginia.